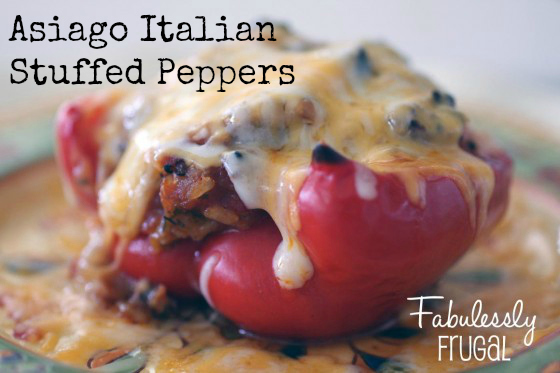 knowing I have Asiago Italian Stuffed Peppers waiting in my freezer for the busy weeks ahead. There are a couple of ways you can make these. Like I did, you can quickly blanch the peppers, fill, and freeze, or you can make the filling and freeze it in a zip-top freezer bag. Just thaw the filling, fill your fresh peppers, and bake. If you like your peppers crisp and with a little crunch, I recommend the later method. I also like to cut my peppers in half, lengthwise. I prefer wider cups and they are easier to freeze in a regular pan. First, boil water! Fill a 3 quart saucepan with water, about 3/4 full. While the water is heating, cut peppers in half, discarding the stems, seeds and white pith. When the water comes to a boil, add to pepper halves, two at a time and blanch for 2 minutes. Remove peppers with tongs, place them in a pan, and set aside while you make the filling. Slip the skins off Italian sausage. Brown sausage and chopped onion well and drain fat. Add marinara sauce, rice, sliced olives, parsley, garlic, Italian seasoning, and red pepper flakes. Simmer for 5 minutes, and then add shredded cheese. Now, this is the time to cool and freeze the filling, or go ahead and fill your peppers. Sip a little lemonade while they cool down and then get them ready to freeze. I like to cover with parchment paper, plastic wrap and then foil. Label and freeze. I usually freeze overnight and then stack my pans. For those of you who are pros at this and want to optimize your freezer space, you can remove them from the pan and tuck them in a freezer bag after they are frozen. When you are ready to eat them, take a pan from the freezer and thaw them in the fridge overnight. Bake at 350 for 45 minutes. Remove from the oven and top with shredded cheese, more Asiago or whatever, and return to the oven for 15 more minutes. Note: On hot summer days, I place my frozen peppers in my slow cooker out on my patio table. Cover and cook on low for 4-5 hours till the peppers are tender. Cut peppers in half, lengthwise. Discard stems, seeds and white pith. Blanch halves in boiling water for 2 minutes. Remove from water with tongs and set pepper cups aside while preparing filling. Brown sausage and onion well, until sausage is no longer pink. Drain fat. Add marinara sauce, rice, olives, parley, garlic, Italian seasoning, and red pepper flakes to the meat mixture and let simmer for 5 minutes. Stir in shredded cheese and cool filling. Place pepper cups in a baking pan and add filling. Cover, label and freeze for 3-6 months. When you'd like to eat them, remove from freezer and thaw in refrigerator overnight. Remove plastic wrap and cover again with foil. Bake at 350 degrees for 45 minutes. Remove from oven, discard foil and sprinkle with desired amount of cheese. Bake for an additional 15 minutes and serve. Makes 12 servings.